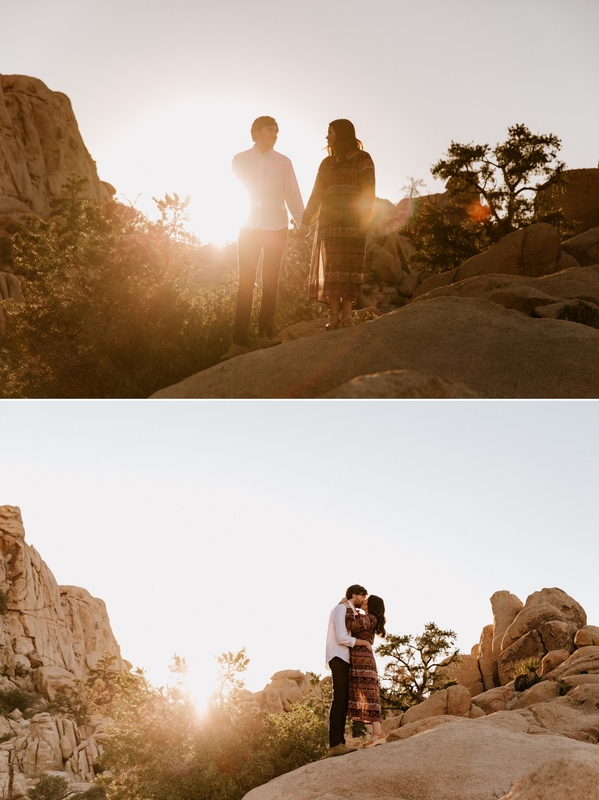 We almost postponed Olivia & Ricky’s desert engagement last May because of high heat warnings. After some back and forth discussion, we decided to brave the conditions anyway and met in Joshua Tree National Park. Sort of unsurprisingly, the park decided to greet us with perfect spring weather. Shame on you, weather man. The golden light began to peek around the valley as we piled into the car together. Our first stop was the massive granite boulders right off the main road. From there, we ventured deep into rocky crevices and stumbled across some late blooming aloe vera plants. The sun beaming through the rocks cast a beautiful halo on everything it touched. In that fleeting moment of beauty…I received my first Joshua Tree bug bite. Ouch. We hopped back in the car and sped towards the rolling fields of wheat in the center of the park. The light wasn’t going to wait on us, so we casually sprinted to the closest Joshua Tree. We only had time for a few stolen dance moves before the sun dipped behind the mountains. Our last pit stop of the evening was Keys View, the iconic scenic vista overlooking the Coachella Valley. Somehow, we made it just in time to watch the heaven’s glorious sunset finale. 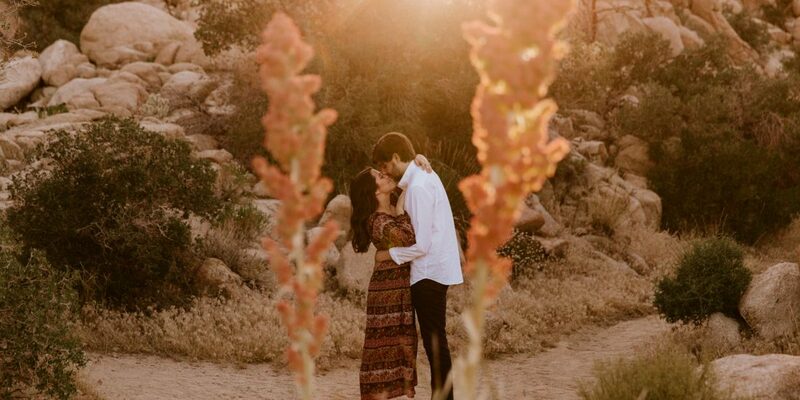 The rainbow sherbert sky moved this desert engagement up a few notches in my book. We watched in awe as the bright sky transcended into dusk, illuminating the city lights below. I kept shooting until there was no more light to shoot in. 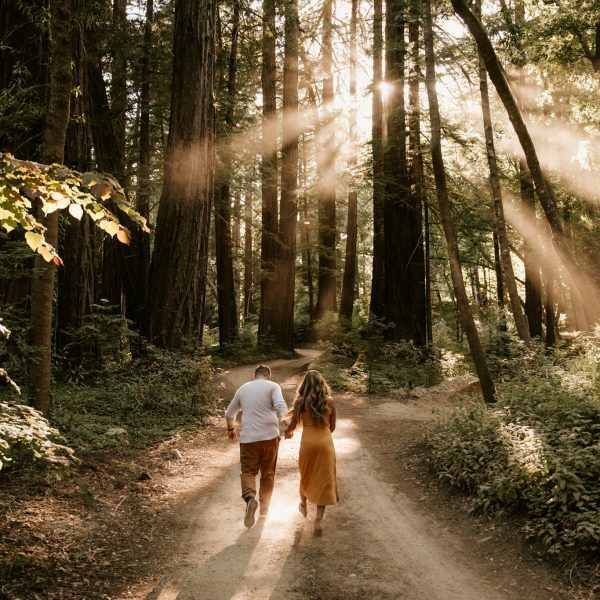 Now that’s how you end an engagement session on a high note. Sit back, hit play, and enjoy the photos. If you liked this session, you can also check out Amitis & Nico’s Joshua Tree engagement or Austin & Kailee’s Sand Dunes Engagement in Glamis! One of the best days of our lives. 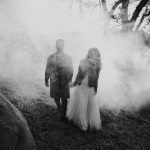 Seriously made us more excited for our wedding photos than ever. Thank you Paige for making that experience so wonderful and memorable.